Just back from Spring Quilt Market! 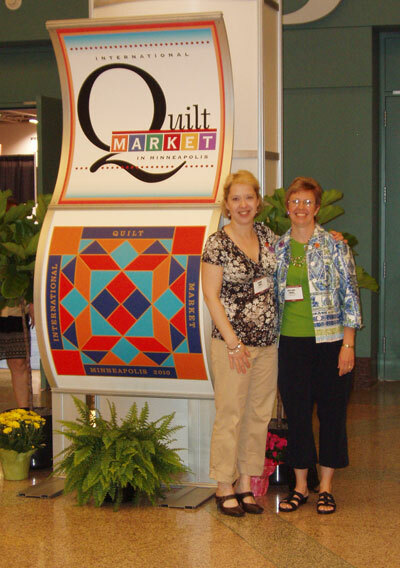 Here we are at the entrance to the 2010 Spring Quilt Market in Minneapolis. That’s my friend and pattern editor, extraordinaire, Connie, on my left! Connie lives in Chicagoland and so now I only get to see her about once a year. What a fabulous time we had spending the weekend looking at all of the new products, patterns and fabrics coming into the marketplace. We were also both very inspired by all of the beautiful quilts we saw. I have lots of ideas spinning in my head! The challenge will be where to start! Over the next few days, I will blog about some of the things we saw and the new products we just had to have! Stay tuned! 4 Responses to Just back from Spring Quilt Market! Hey plane buddy! I’m so glad you made it home safe! It was so nice to have you two next to me on the way home. Could you give me the link to Connie’s blog? I want to read her praying mantis story! Thanks SO MUCH for inviting me along! I had a simply terrific time and I’m feeling so hyped up about quilting! It was a great weekend!!!! Let’s just not think about my proclivity toward motion sickness! 🙂 I think you should get an award for agreeing to travel by plane with me! What a trooper of a friend! See piecesofbliss.blogspot.com. August 30 ’08 post. My blog has been collecting dust since I went back to work (bad Connie). Maybe one of these days I’ll start it up again–I need to learn how to be more productive like you, Samantha! Hope the rest of your flight home went smoothly! It was great to meet you, Samantha! Glad you had a safe ride home, as well!